The abrasive sleeve carrier FAPI-SOFT consists of a body with a slotted coating and an axis. The coating can be selected from several coating types with different degrees of hardness. Thus different highly elastic sponge rubbers, elastomer foams up to para rubber as covering for the abrasive sleeve carrier FAPI-SOFT are possible. However, the degree of hardness should not be too high, otherwise the clamping effect between the abrasive sleeve and the abrasive sleeve carrier is not achieved during use, as the individual slots do not expand with the peripheral speed. Different coatings for different grinding operations lead to very different grinding results. In the following table you will find the individual coverings with their hardnesses. The abrasive sleeve holders FAPI-SOFT are usually clamped in electrically or pneumatically operated hand drills. The corresponding abrasive sleeve is then applied to the carrier. When switching on the machine, the circumferential speed (observe minimum speed!) 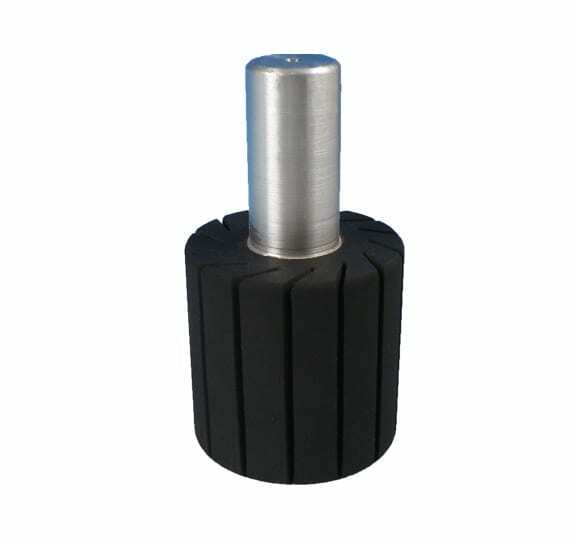 expands the slots on the abrasive sleeve carrier and tensions the abrasive sleeve or gives the abrasive sleeve a non-slip hold. A secure fit between the abrasive sleeve and the abrasive sleeve carrier is only guaranteed at the specified minimum speed due to the very high accuracy of fit between the abrasive sleeve and the abrasive sleeve carrier. 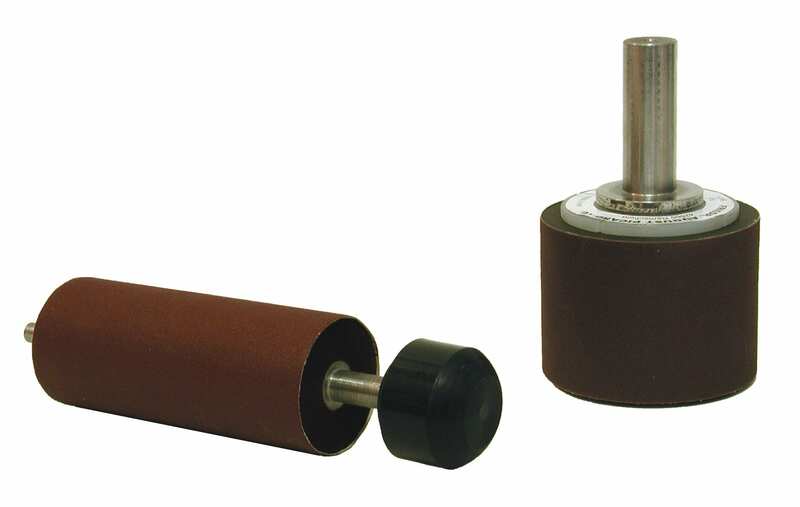 FAPI-SOFT abrasive sleeve holders are used in both the metalworking and woodworking industries. The great advantage of machining workpieces is that longitudinal grinding is achieved rather than cross grinding, as is the case with disc sanders. In particular, FAPI-SOFT abrasive sleeve holders are used when it is no longer possible to hold the workpiece in front of an abrasive tool due to the size or weight of the workpiece to be machined. Also, the accessibility to the working area, for example during assembly or repair work, often does not allow other grinding tools to be used. Typical areas of application in the metal sector include the removal of welding seams in steel construction, the machining of edges and contours in turbine construction and the finishing of assembly work. In addition, abrasive sleeve carriers are also used for repair work and fine sanding. In the wood sector, typical areas of application for FAPI-SOFT abrasive sleeve supports include the regrinding of glued joints in the seating furniture industry and other large wooden parts. A prerequisite for the use of the FAPI-SOFT abrasive sleeve holders is the required minimum cutting speed, as only then can sufficient tension of the abrasive sleeves be achieved.